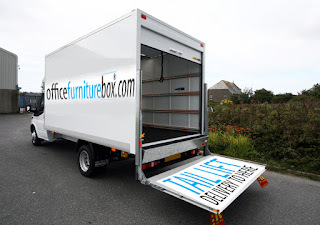 The Office Furniture Box Blog: Free Furniture Delivery! At Office Furniture Box, we make sure we provide details of all of our prices up front, so you don't get any nasty surprises when you come to process your order. The most common 'surprise' that can be sprung on customers is the delivery charge, which can be quite substantial. Because of the bulky or heavy nature of office furniture products, large delivery costs can often be dropped on customers at the last minute, often when it's too late to back out of an order. This is something that we wholeheartedly disagree with! We make sure that everyone is fully aware of our costs from the outset. Delivery to nearly all UK Mainland addresses is completely free - whether it's a single chair or a full office re-vamp. This is a tailgate delivery: so our driver will bring the furniture to your address, and then require you to assist with offloading. We will always be as helpful as possible, but the emphasis of this style of delivery is driver only! There are a few exceptions to our free delivery policy, and for these we rely on the customer to notify us of their location and we can work out a delivery price for them. We always keep these as sensible as possible, and notify the customer as early as we can so everyone is fully aware of all costs from the outset. We can also deliver to a shipping agent for you at no extra cost, so if you're buying to export then just let us know! At Officefurniturebox.com we're obviously aware that many of our customers may want some help beyond the tailgate delivery that we offer - particularly when it comes to assembling and positioning their furniture as well, and we're more than happy to oblige. We offer a full fit out service when needed to make sure that you're purchase runs as smoothly as possible. This is the quickest and easiest way for you to get your furniture. Our fitters will bring it to site for you, assemble your furniture and position it in situ for you. We'll also deal with the recycling of all packaging for you! We work out prices for this service based on each individual project, so all you have to do is get in touch for a quote. If you're working on a big project or a full office re-fit then we can often provide this service for free, but it all depends on the scale and location of the project. We always recommend getting in touch for a quote to see how we can help!